Boeing is challenging the Danish government’s recommendation that Denmark select Lockheed Martin’s F-35 for its next-generation fighter fleet, claiming that the Danes used flawed data to determine the cost of each plane. Lockheed Martin’s Sikorsky Aircraft Corp. won a contract from the U.S. Army for UH-60M Black Hawk helicopters. This is a modification contract, which is valued at $88.1 million. A division of L-3 Communications is objecting to a $350.6 million contract awarded to Raytheon. The chief executive of Ascent Flight Training was the guest of Airbus Helicopters at a recent industry dinner, fueling speculation that Airbus has won the yet unannounced contract to provide and support rotorcraft to train British military crews starting 2018. Polaris Defense reports it has added a high-performance turbo-diesel variant to its line of lightweight off-road vehicles for the military. Sweden’s state-funded military materials procurement agency is denying that a deal has been struck to sell 12 Saab JAS Gripen C/D multirole fighters to Botswana. Försvarets Materielverk confirmed that while the organization is “in talks” with Botswana, the number of aircraft under discussion is around eight and not 16. Lockheed Martin has been awarded a $54.9 million U.S. Navy firm-fixed-price contract for the P-3C mission system refresh program. Boeing has been awarded a $16.2 million Air Force contract for satellite waveforms. BAE Systems has been selected by DARPA to develop a system that will allow underwater craft to navigate accurately even when sailing below the surface of the water. When paratroopers from the U.S. Army’s 82nd Airborne division’s quick-reaction force jump near Torun, Poland, next month on a NATO exercise, an all-terrain vehicle it’s evaluating will descend by parachute as well, an Army commander said. 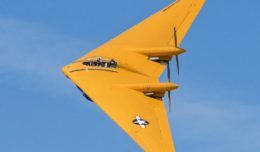 A top Air Force general May 19 ruled out the possibility that the Pentagon would partner with allied nations to develop the next-generation B-21 bomber. Good fences make good neighbors, which is why the United States is building a space fence. Eight months after he was first nominated, Eric Fanning was sworn in May 18 as the Army’s top civilian leader. Spring Lake, N.C., veteran Wilbur Amos says he grows weaker by the day awaiting a surgery that would fix his three excruciating hernias. Some days are worse than others for Amos and the symptoms vary, and Amos said he’s worried one day he’ll inadvertently twist his bowels and die from septic shock if he’s not treated with surgery soon. Ronald Mallory eyed the name before him, carefully reading the letters etched permanently into the smooth black marble alongside 58,000 others. Veterans who served on Navy ships off Vietnam and have diseases linked to Agent Orange were buoyed Thursday by House passage of a measure that could expand their Veterans Affairs benefits. Veterans whose war wounds have rendered them infertile are one step closer to having their service-related condition covered by the Veterans Affairs Department. Sen. Angus King, I-Maine, has introduced an amendment he says would help veterans more easily get student loan forgiveness. A group of 12 federal employee unions and associations are voicing their displeasure with several provisions in the Veterans First Act. SpaceX has managed to land three rockets from space back on Earth – two on sea and one on land. A Franco-Italian aerospace manufacturer is developing an autonomous airship that could be the eye in the sky for government agencies.